One of the most wonderful things about staying in the San Lorenzo area of Rome was the amazing street art and “graffiti” that I did not expect to see so much of. Terrific stuff! On my first visit there I was walking near my B&B and came across an embellished utility box on the side of a building. A little girl about to kiss her black kitten. I took out my little camera; it was one of the first photos I stopped to take on that trip because I was so excited to see this little gem. I discovered later that it was painted by Alice Pasquini. Here is another one, a little girl looking up with her fluffy puppy by her side. I tried to frame her as best I could in the photo (as she was surrounded by a less than pristine pavement, parked cars and bits of debris) and I ultimately used some filters on it so the focus could be on her. 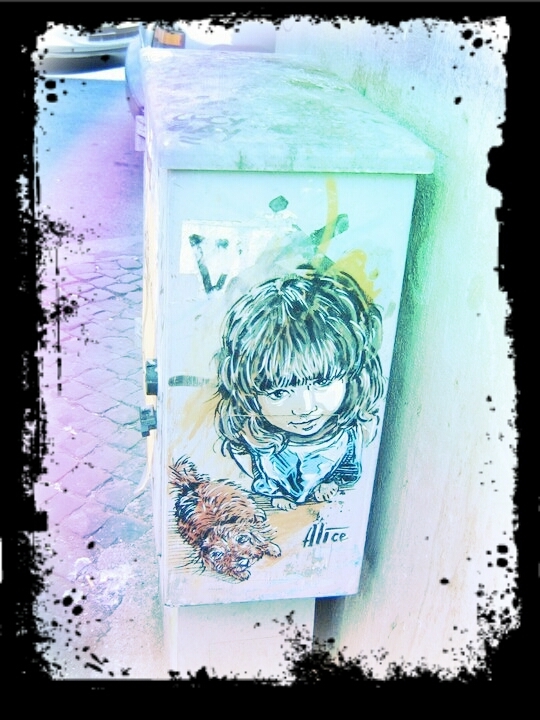 Thank you Alice, these small street art pieces were a joy to see, and made me love Rome that much more. She transformed a fantastic wall on Via dei Sabelli with a series of images. The past few years I have visited this wall and the art is always slightly different. I look forward to seeing this wall again soon and hope that Alice will still be the featured artist there.